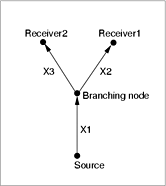 Xj stands for the delay contributions of the individual links. The end-to-end delays are related to the link delays by Y1=X1+X2, Y2=X1+X3. The figure on the left indicates a part of the obtained end-to-end delay time-series. The red and green curves stand respectively for the delays Y1 and Y2. To achieve the desired goal we implemented the network tomography tool described in detail in our technical report. In short the tool quantized the measured end-to-end delays into uniform sized bins, and uses a maximum-likelihood estimation based approach to specify the probabilities of the delay to fall into a given bin on a given link. Below we show the comparison between the real and the estimated link delay distributions, and the associated average delays. Above the tomography tool used 40 bins each of size 0.05 ms. It is apparent looking at the values in the table, that the error between the real and the estimated average delays are within the minimal theoretical limit of 1 bin size.